John McDonnell will today lead calls for a “manufacturing renaissance” to power Britain’s economy in the aftermath of Brexit. The shadow chancellor will set out his vision of a “high investment, high productivity” future and draw on Germany’s Mittelstand, in which the success of medium-sized firms has helped deliver widespread prosperity. He will also seek to move the pressure over Brexit back on to the government – following a Labour rebellion earlier over article 50 earlier this month – and tell the Tories that the Opposition has not written them a “blank cheque”. Some 52 Labour MPs broke Jeremy Corbyn’s three-line whip to vote against the formal trigger for Britain’s withdrawal from the EU but today McDonnell, one of the leader’s closest allies, will try to increase pressure on Philip Hammond, the chancellor, in the run-up to the budget. “Labour voted to give the government authority to begin that process, but we have not handed them a blank cheque. The next two years or more will involve intense negotiations and scrutiny of the government and other positions. But more than this, I believe they will involve a significant national conversation about the kind of society and economy we want to live in,” he is expected to say. 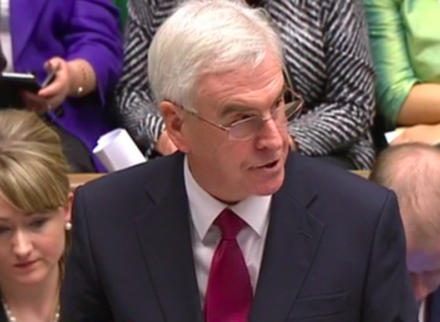 McDonnell will repeat his view that the EU referendum represented a “vote for change” and pledge that Labour will make the case for a significant economic reform in the aftermath of Brexit. “Labour will place support for our manufacturing sector at the centre of its approach to Brexit, and at the heart of its economic policymaking,” he will say at the EEF conference in London. “We can build on the success that is already out there and develop a ‘British Mittelstand’: high-investment, high-productivity smaller firms that provide high-quality employment in those sectors where we have the greatest potential like high-value added manufacturing.